I needed a quick and hearty dinner. My husband and I were having a very busy couple of days where we would leave very early in the morning and return very late at night. Most days, we came home exhausted and I was not very inclined to cook. Fortunately, one of the days, we came home relatively early and after a short nap, I was ready to make a good dinner. Luckily, I had all the ingredients on hand and since this makes at least 8 portions for us, it was a perfect dish for the remaining week. This is my version of a Chicken Parmesan Bake. Place a layer of chicken on top of the pasta. Add remaining pasta to pan and cover with remaining pasta sauce. Bake Chicken Parmesan for about 30 minutes or until the cheese is all melted and starts to brown. Definitely 🙂 I was so tired that week, I needed something that would make a lot of food. I couldn’t believe my brain functioned enough to remember to make this lol. You used my favorite “Panko Breadcrumbs” in this dish. And I love that you used chicken thighs for this dish as well. 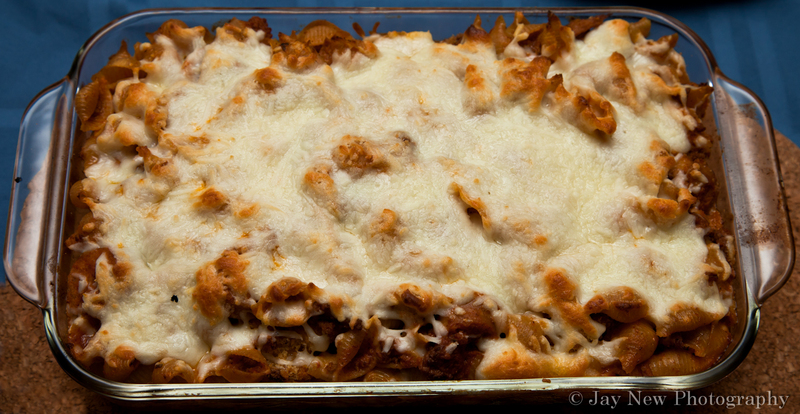 I really like this chicken parmesan bake. Wonderful comfort food. Yum, Samina! I love it! Looks very comforting! Thank you 🙂 I love chicken and pasta! That’s a great idea. Leftovers save us all the time! I like how you don’t have to cook pasta on the side, it’s all in one dish. One dish wonders are always a favorite of mine 🙂 This dish saved our butts the rest of the weeks lol.